Lange Q&A Physician Assistant Examination is filled with over 1,300 Q&As that help you gear up for the PANCE and PANRE. All questions appear in the style you will see on the actual exam, and are accompanied by a detailed answer explanation and references. In addition, each question in this skill-sharpening guide is conveniently organized by organ system or specialty area to help you quickly zero in on areas of strength and weakness. A valuable opening chapter on test-taking skills and techniques provides score-boosting hints on how to best prepare for taking the exam. Also included with the book is access to one complete online practice test that simulates the test-taking experience. The content of Lange Q&A Physician Assistant Examination is reviewed by a team of PA students for accuracy and relevancy and is organized by organ system and specialty areas of practice. The seventh edition of this first-rate test-prep tool is thoroughly revised with 40% new Q&As. The book is also redesigned in an eye-catching 2-color layout that enhances readability and review of the material. 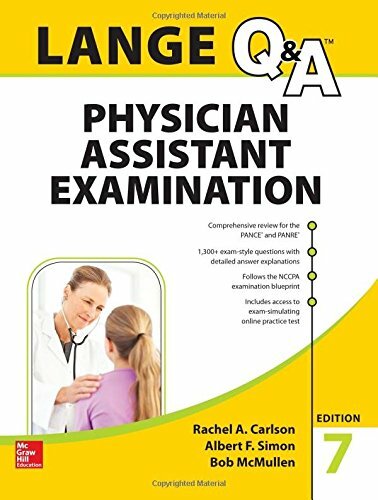 Taken together, Lange Q&A Physician Assistant Examination has everything you need to ace the PANCE and PANRE.